Be prepared for Spring frosts. Even this winter, which has been so mild in our corner of the South West of England, we’ve been lighting our wood burner and open fire in the evenings. At time of writing we’re told that colder weather is on its way whilst in the North of England severe rain storms and snow have been testing even the stoutest of northern souls. The heart-warming focus of increasingly more homes is an open log fire or wood burning stoves and with wintry weather still with us, there’s still a window of opportunity to ensure those fires are fully equipped for action and super safe. This fire feature is especially pertinent for those moving house, renovating heritage properties or those with pets and children bouncing around the place. Equipping yourselves with a top-quality fire guard can bring true peace of mind to pet owners, parents, grand parents, aunties & uncles. Investing in a sturdy, large designer log holder (other sizes are available!) will save multiple trips out to the wood pile so that you can work at relaxing in front of the fire. 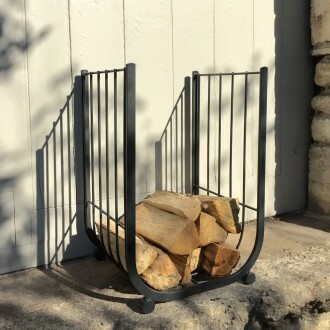 The interiors of period homes, more contemporary minimalist spaces and ‘eclectic’ halfway house interior design styles can all be served by our two ultra stylish designs of fireguard and log holders. Having your fireguard made to measure will also ensure the best fit possible round your stove or open fire. Garden Requisites’ Traditional Metal Fireguards are inspired by the original historic design of the Victorian nursery guard, incorporating our signature handmade English wirework. To increase protection from open fires, spark liners can be built in, preventing errant sparks reaching treasured rugs and carpets. And for more modern abodes, the new, vertical-barred design of the Contemporary Fireguards will complement even the most pared back of minimal looks. Our new-in-2015 log holders neatly match these two versatile styles and the resulting sets really do look special together. We especially love to find solutions for customers with log burners that are positioned against a wall, not within a traditional fireplace; we’re one of the very few (possibly the only) UK makers that manufacture wrap round stove guards, made to measure. As it happens, we have someTraditional Fireguards in black ready to go, so we are offering £50 off the black version while stocks last. All our guards are available in three finishes – Aged Zinc, Jet Black or Anthracite Grey but we can also provide bespoke paint colour options for those with an eye on clever colour coordination. Garden Requisites’ fireguards and log holders really are a cut above the rest. There are plenty of mass-produced, low quality designs out there but if you’re seeking the kind that you’ll be handing down to your children and they to their children, then search no further. We continuously strive to produce long-lasting and well-loved heirlooms to be handed down through the generations so your investment will be one that’s very well made indeed. All our zinc-galvanised steel structures (for gardens and interiors) are produced in our busy workshop based in Batheaston, near Bath, England. Have a little look at our craftsmen in action. You’ll be safe in the knowledge that care and attention to detail are integral to our work. Talking of which, it’s time to fire up that burner! Stay safe and warm.